Bush and Kerry are in a statistical tie in North Carolina, of all places. A new poll by Research 2000 puts Bush at 48% and Kerry at 45%, with a margin of error of 4%. The previous poll there had Bush with a 7% lead. Perhaps the people of North Carolina are beginning to warm to the idea of their senator as vice president. We'll see what happens on the next poll though. It is interesting to note that four southern states that were expected to be easy wins for Bush are now statistical ties: Virginia, North Carolina, Arkansas and Tennessee. If Mary Beth Cahill thinks she has a shot there, she may invest some money down there and make Bush spend time and money there too. 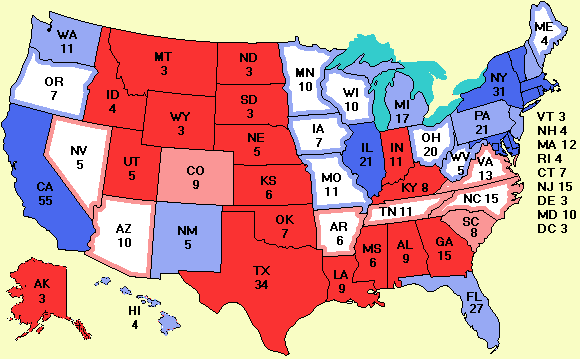 On the other hand, when Karl Rove looks at the map, he might say: "Gee, Maine, Minnesota, and Oregon seem to be in play. Let's make Kerry fight for them." The other "Barely" states were expected to be battlegrounds and are. I have had a page on George Bush's track record for some time. Some people have asked for one on Kerry's track record. Fair enough. He's been in the Senate 20 years and has voted thousands of times on abortion, the budget, civil rights, corporate malfeasance, crime, education, energy, the environment, families & children, foreign policy, health care, homeland security, jobs, social security, tax reform, war & peace, and much more. Don't believe what either campaign says about his record. Look for yourself..
And last, but never least, a new cartoon of the week.